In 1998 - after two successfull shakin` events in 1995 and 1997 (see "festival history") we decided to launch "Shake the Lake" as a big international boogie & blues festival which should happen once a year. It was at the time when the Scalaria Eventresort just opened its doors - at that time still named "Schloss am Wolfgangsee". Peter Gastberger, The owner of the new, unconventional resort was impressed by the idea to organize a boogie-festival in the "Circus Circus Theater-Restaurant" in his hotel. After long, headaching thinking we created the brand-name "Shake the Lake" - it was such a cool name that we protected it as a registered trade-mark! It was necessary to communicate the name, the brand, the idea to the public. Shake the Lake should be more than a festival, more than music - it is an idea of living, it is lifestyle..., - it is our unique way of life "around the lake and around the piano". We needed a special story which attracts the interests of the people! We needed an "eyecatcher"! 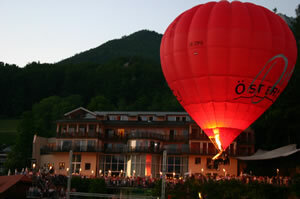 Just in the moment when we were sitting together, drinking a fine glass of wine in the new scalaria lakeside-lounge, thinking hard about what we could do, Helmut Tucek of the Balloon & Airship Company St. Wolfgang entered the room... 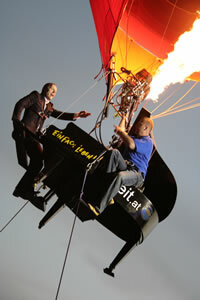 When we saw him, the perfect idea flashed into our minds: Let`s put a grand piano on a balloon....!!! Halelujah! This was a great idea! Yeah! But security? Technical problems? Weather-conditions...? 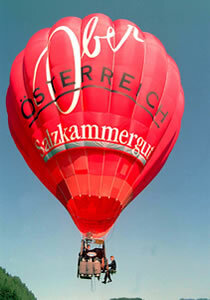 Heli Tucek`s & Peter Gastberger`s simple answer was: Let`s do it! And they did it! We did it! When we sent out the invitations for the "Vince Weber shaking on the floating balloon on the grand piano above the lake in front of the Scalaria-terrasse" nobody could imagine how this would work! The info should be on the press before the concert. Therefore we invited journalists and fotographs for a fotoshooting-press conference at any day before the event where the weather was good. The effect in the media was perfect: Pictures and stories were on the best pages of all important national newspapers...! On the day of the event we were lucky - because the weather was fine even on that day! So we could launch the balloon in front of about 300 invited people. 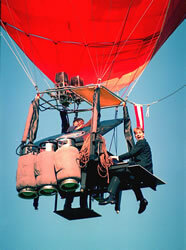 They experienced the first piano-concert on a balloon - with a real piano! With real good sound! "The Boogieballoon" had his worldwide premiere...!!! Since then only those 300 people experienced that extraordinary act. They told it their friends who told it their friends who told it their friends... A lot of people asked us to launch the boogieballoon again...! In 2005 it was the year of the relaunch! 10 years Shake the Lake anniversary! 2010 it is time to celebrate the 15 years...! Come and boogieballoon with us!